Actor Jussie Smollett returned to court Thursday as he pleaded not guilty to 16 felony counts. NBC 5's Ash-har Quraishi has the story. "Empire" actor Jussie Smollett entered a plea of not guilty on multiple disorderly conduct charges Thursday. He arrived at the Cook County courthouse shortly before 9 a.m. CT ahead of a hearing to assign a judge to his case, followed by his arraignment. Within minutes, Judge Steven Watkins was assigned to his case, with the arraignment beginning an hour later. Smollett, standing quietly alongside his three attorneys, pleaded not guilty to 16 felony counts at the arraignment. Watkins also granted a motion to allow Smollett to travel to New York and California, where his attorneys' offices are located, as needed to meet with his counsel, provided he notify his pre-trial officer of any travel. Smollett's lawyer Tina Glandian requested that the next court date, for discovery, be "as soon as possible." Watkins, prosecutors and Smollett's legal team agreed on the morning of April 17 for his next court appearance. Smollett was initially charged with one felony count of disorderly conduct in filing a false police report in February, with Chicago police alleging that he staged a hate crime attack on himself the month before because he was "dissatisfied with his salary." A Cook County grand jury then indicted Smollett on 16 felony counts last Friday in connection with his reporting of the alleged attack he claimed to have suffered in Chicago's Streeterville neighborhood. The lawyer for the brothers, Obabinjo Osundairo and Abimbola Osundairo, said Monday that the pair has evidence backing their claim that he orchestrated the attack. Smollett's lawyers said "misinformation" has been reported in the case and noted they plan to prove a lack of evidence in the case. Smollett was indicted on 16 additional counts of disorderly conduct in filing a false report, court documents show, superceding the previous charge brought by the Cook County state's attorney's office. All 16 counts are Class 4 felonies, the most serious of which carry a maximum sentence of one-to-three years in prison. Probation is also possible. The indictment issued by the grand jury lays out two separate sets of charges against the actor. The first set alleges that Smollett lied to responding officers, making false statements about the nature of the attack in his initial report to police. 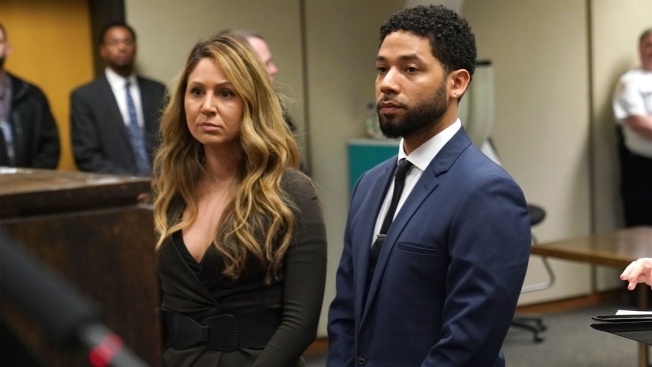 Smollett's attorneys said they will "push back against" the additional charges filed against their client, which his attorney Mark Geragos said were "not unexpected." "What is unexpected however, is the prosecutorial overkill in charging 16 separate counts against Jussie," Geragos said. "This redundant and vindictive indictment is nothing more than a desperate attempt to make headlines in order to distract from the internal investigation launched to investigate the outrageous leaking of false information by the Chicago Police Department and the shameless and illegal invasion of Jussie's privacy in tampering with his medical records." Smollett previously appeared in Cook County court on Tuesday at a hearing in which a judge ruled that cameras would be allowed in the courtroom Thursday. A spokeswoman for his attorneys said Smollett's appearance Tuesday wasn't required, but that he wanted to "show up and show respect to the court." "He wants to hold his head up high, show confidence in his innocence," Anne Kavanagh said, adding that he plans to "go the extra mile" to prove his innocence. "He's not hiding from anything," she said. "He will do everything he needs to do."